The Dark Ranger: Jagr Haters? Hardly. Rumors are abuzz throughout the blogosphere that Avangard Omsk - the Russian hockey league - is offering New York Ranger forward Jaromir Jagr upwards to $12 million to play in this upcoming season, which puts our very own GM Glen 'Slats' Sather in quite the precarious position as he is currently negotiating with Jags, probably looking to secure some one-t0-two year deal for less than he was paying him this current season - with incentive bonuses. Stay tuned. While we eagerly await our 2009-10 fate of whether Tom Renney will finally coach (for real) our team without Jagr or will he (pretend to) coach with Jagr in the lineup, I thought it was thoughtful to look back at the playoffs and see what the Pittsburgh fans really think of their ex-Pittsburgh Penguin Jagr , when Jags played side-by-side to Lemieux's #1 seating. The very fact that Pittsburgh fans boo'ed him every time he touched the puck this season is a good reading of 'Jagr Hating', but in looking a little closer the reality was very different. (As you know, The Dark Ranger has been accused of being a "Jagr Hater" myself (which I am not - "it's just time to move on...")). You should be ashamed of yourself saying anything negative about Jagr after what this man did for your hockey team .You and the rest of the pitt boobirds should not be so quick to forget. Ask any Ranger fan if they ever booed Messier when he came back to the garden in a Cannucks uniform, Leach in a Bruins uniform. the answer is NO, Why Beacause Ranger Fans Have CLASS .something all of pitts. needs to learn .BTW IT AINT OVER TILL ITS OVER !!!! I have never really understood the venom Penguins fans display to one of the all-time greats in Jaromir Jagr. It makes me very sad and cringe every time the igloo boos him. It seems like one, people forget what Jagr did while he was a Penguin, I don't. He carried this franchise during some of the darkest days of the Penguins era. Two, people also forget that Jagr, though vocal about his desire to be traded, knew there was no other option. Do people forget the team was in financial ruin? Do they forget this team was in danger of leaving the city? It was not just Jagr who was victim of the post Howard Baldwin spending spree. Was he not supposed to take the money? Baldwin spent like a teenage girl with a credit card at Macys. Ron Francis, Martin Straka, Alexei Kovalev, and Robert Lang were among many players who simply had to be moved due to financial constraints. In the pre-salary cap NHL, many teams could not keep up with the free spending Red Wings, Flyers, and Rangers. Jagr saw the writing on the wall and personally, I think he asked for a trade because he knew there was no other options. Out of respect for Mario Lemieux, he took the role as bad guy. Could he have handled the situation better? Sure, but he and the Pens were out of options. Look at it this way. If Jagr does not get traded...Pens never get Marc-Andre Fleury, Sidney Crosby or Evgeni Malkin. The Pens are likely playing in Kansas City or Seattle. Mario Lemieux is not the super-hero he is deservedly considered to be now for saving the Pens. We are not waiting for a beatiful new arena. We are watching another team dominate the NHL like no one has in a long time. To anyone reading this who boos Jagr every time he touches the puck. Did you become a Pens fan after Sidney Crosby got drafted? Did you not watch Jagr play a critical role in winning two Stanley Cups? Did you not have the pleasure of watching the best player not named Lemieux or Gretzky for a decade? Next time you feel like being a dim wit and booing someone who was a victim of circumstance and the mismanagement of others, think about it and shut up. Im done ranting...Lets go Pens. For anyone that boos Jags at the Igloo, you must be one of those Pens fans who didn't know any of the Pens' names 2 seasons ago. Jagr's a big reason the Pens won their last cup. I think you should go back to playing tiddlywinks. Bloody bandwagoners who suddenly think they know something about hockey.. ugh! Jaromir Jagr is no longer a Penguin and hasn’t been one for a long long time. Jaromir Jagr had/has a gambling problem. As a good Burgher, I should boo and hate and possibly try to Juju-curse Jaromir Jagr, because he is a “traitor” and because he talks smack about Sid. I love Jaromir Jagr. I always have and unless he hunts me down and sticks an angry pigeon down my shirt, I always will. If I wasn’t already dealing with the constant bickering of three very different imaginary self-united husbands, I’d totally self-unite with Jaromir Jagr, too. 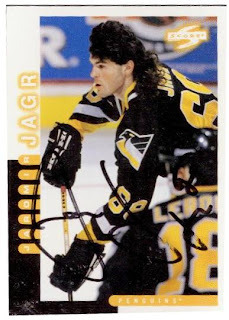 Jaromir Jagr is a fun name to say. When Jaromir Jagr and Ruutu were jawing at each other yesterday, and Jaromir threw some jesting kissy-kisses at Ruutu, resulting in Ruutu pushing him to the ice in anger … I loved Jaromir Jagr all the more. I love Ruutu, but come on, that was awesome. As suggested to me by a reader, I completely agree that the Pens should sign Jaromir Jagr to a one-year contract so that he can end his career as a Penguin. I have never and will never boo Jaromir Jagr at a Penguins game for several reasons, about 429 of them. After watching his spirited play last night and his solid play throughout the playoffs I hope he doesn't go to the Russian Super League next year. Jagr is still a great player and should continue to play in the NHL. If the next game is perhaps his last in the NHL, as he stated, then I wish Jagr the best and hope he goes into the Hall of Fame as a member of the Penguins. J A R O M I R when rearranged spells MARIO JR. So with that, there is some Jagr sentiment in The Igloo -- not that us Rangers fans need to cheer on the Atlantic Division during the Stanley Cup finals this weekend, but it was a surprise to see how much support Jaromir Jagr has received from his former fan base. Let's go Red Wings and bring on the "Sid Haters", a more timely discussion point as the first game arrives this Saturday. 2) In the end JJ will probably play a couple of years in Europe after his NHL days are over. Not to worry, Jagr won't need a benefit if he takes less money to stay in NY. At some point its more about ego than the cash.